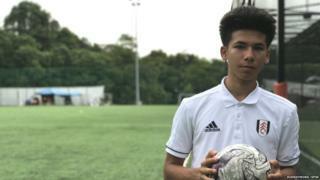 The first Singaporean footballer to sign a professional contract with an English Premier League club has been denied the chance to defer mandatory military service. Benjamin Davis, 17, who has a two-year deal with Fulham, had applied to defer from national service (NS). Authorities said that he did not “meet the criteria for deferment”. But Davis’s father said it was “unrealistic” that he would be expected to take two years out of football. All Singaporean men over 18 have to serve in either the armed forces, the police or the civil defence force for two years as part of their NS requirements. Benjamin turns 18 this November. “As all male Singaporeans liable for full-time NS put aside personal pursuits to dutifully enlist… it would not be fair to approve applications for deferment for individuals to pursue their own careers and development,” said the Ministry of Defence in a statement. Reality Check: Which countries have military service? National service: What’s your view? Benjamin joined Fulham on a two-year scholarship last year. He signed a professional contract this month, becoming the first Singaporean to do so with a top-level English club. He currently plays for Fulham’s Under-18 team. The Premier League has a strong following in Singapore and many in the city state are unhappy with the decision over Davis. Congratulations to Singapore youth international Ben Davis for signing a two-year professional contract with @FulhamFC! Harvey Davis told the BBC that his son was looking to appeal against the defence ministry’s decision. On social media, many spoke out against the decision to deny the NS deferment. “This boy is denied an amazing opportunity. I am [at a] loss for words,” said one user on Facebook. “Can NS be more flexible? This is our only chance [to] succeed in the English Premier League,” another added. Some also pointed out that Singapore’s deputy prime minister had praised World Cup champions France in a Facebook post for producing home-grown football players. And there were those that called for Benjamin to give up his Singapore citizenship. “[There’s] no need to stay in Singapore if you feel pastures are better elsewhere,” one person said. Benjamin currently holds Thai, British and Singaporean passports – his mother is Thai and his father is originally from the UK. When asked if Benjamin would give up his Singapore citizenship, Mr Davis said: “I wouldn’t know what choice we would have if we are forced into that position. Singapore has in the past granted NS deferments to three athletes. One of them was swimmer Joseph Schooling, who went on to win the nation’s first ever Olympic gold medal at the 2016 Games.